The rate of change of velocity often depicted as “g’s” or in “mm/s2” in the metric system or “in/sec2” in the English system. Acceleration is not constant but will vary through the vibration cycle, reaching maximum levels as velocity reaches its minimum. This is typically when a particular mass has decelerated to a stop and is about to begin accelerating again. A transducer whose electrical output responds directly to acceleration. Accelerometers typically cover a much wider frequency range, along them to pick up signals not present with other types of transducers. Due to the frequency range, accelerometers are ideal for most types of rotating equipment, making them the most used transducer for vibration measurements. A condition where components within a drivetrain are parallel or perpendicular, according to design requirements. 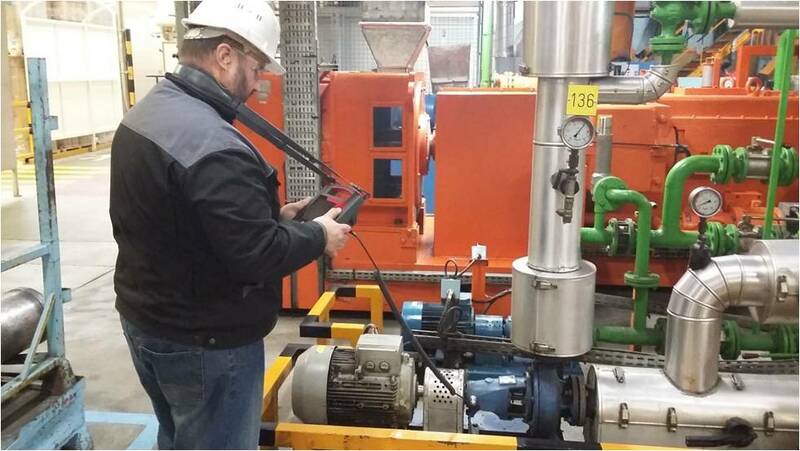 The Tester can diagnose misalignment conditions where these components are no longer aligned according to design requirements, causing excessive bearing wear and power consumption in the machine. Attachment pads (bronze or stainless steel) can be placed at appropriate measuring locations on machines using an industrial adhesive. The triaxial accelerometer is attached to these pads for measurement collection. The pad may include an alignment notch to ensure the consistent orientation of the accelerometer to the three vibration axes (Radial, Tangential, and Axial). The pad ensures a good transfer of vibration data to the transducer by providing a strong and consistent mounting location. One of the three vibration axes (Radial, Tangential and Axial), the axial plane is parallel to the centerline of a shaft or turning axis of a rotating part. (mechanical) Adjusting the distribution of mass in a rotating element, to reduce vibratory forces generated by rotation. 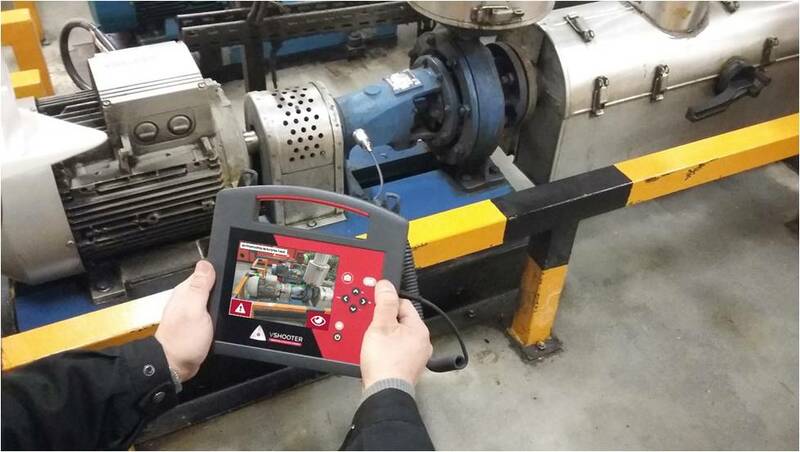 The measurement, recording and analysis of machinery parameters (such as acceleration) to determine equipment health. Current condition is compared to when the machine was new. Also known as machinery health monitoring. When measuring machinery vibration, displacement represents the actual distance the vibration causes the part in question to move. It is measured in thousandths of an inch (mils) in the English system and in millimeters (mm) in the metric system. The event, or inoperable state, in which any item or part of an item does not, or would not, perform as specified. The mechanical or physical parts that results in failure. The vibration of a machine caused by some mechanical excitation. If the excitation is periodic and continuous, the response motion eventually becomes steady-state. The number of events that occur within a fixed time period, frequency is also calculated as the reciprocal of time (i.e. one divided by the time interval). Frequency is typically expressed in terms of Herz (Hz), but can also be expressed as cycles per minute (cpm) or revolutions per minute (rpm) when multiplying Hz times 60. It can also be represented as multiples of turning speed, or “orders,” where frequency in rpm is divided by the turning speed of the machine. Since vibration exists within the time domain, a vibration signal is represented as a time wave form if viewed on an oscilloscope. If plotted, the time waveform would represent a plot of amplitude vs. time. If the waveform were transformed to the frequency domain, the result would be a spectrum representing a plot of amplitude vs. frequency. A sinusoidal quantity having a frequency that is an integral multiple (´2, ´3, etc.) of a fundamental (´1) frequency. In the output signal of a device, distortion caused by the presence of frequencies not present in the input signal. (lower-case h, but abbreviated Hz) The unit of frequency. A condition on rotating equipment where the center of mass does not lie on the center of rotation. Imbalance can severely reduce bearing life as well as cause undue machine vibration. A reduction in motion severity, usually by a resilient support. A shock mount or isolator attenuates shock. A vibration mount or isolator attenuates steady-state vibration. A measurement of reliability for repairable items: The mean number of life units during which all parts of the item perform within their specified limits, during a particular measurement interval under stated conditions. A basic measure of reliability for non-repairable items: The total number of life units of an item divided by the total number of failures within that population, during a particular measurement interval under stated conditions. In rotating machines, orders are multiples or harmonics of the running speed (or associated reference component). Rotation in the plane of forward motion, about the left-right axis. One of the three vibration axes (Radial, Tangential and Axial), the radial plane represents the direction from the transducer to the center of the shaft on rotating equipment. For typical horizontal machines, Radial equals the vertical axis. For Horizontal machines Radial refers the Horizontal axis to which the accelerometer is attached. The maximum deviation from the mean of corresponding data points taken under identical conditions. The maximum difference in output for identically-repeated stimuli when there is no change in other test conditions. Testing that reproduces a specified desired history. The smallest input change that produces a detectable change in an instrument’s output. Determining what actually caused a failure. The speed, usually expressed in revolutions per minute (rpm), at which a rotating machine runs. It may also be expressed in Hz by dividing rpm by 60. The ratio between electrical signal (output) and mechanical quantity (input). Sensor with no moving parts. One of the three vibration axes (Radial, Tangential and Axial), the tangential plane is positioned 90 degrees to the Radial plane, running tangent to the drive shaft. For typical horizontal machines, tangential equals the horizontal axis. For typical vertical machines tangential equals the second horizontal axis perpendicular to the mounting of the accelerometer. Unequal mass distribution on a rotor. The mass centerline does not coincide with the rotation or geometric centerline. Also known as imbalance. Velocity is the rate of change in position, measured in distance per unit of time. 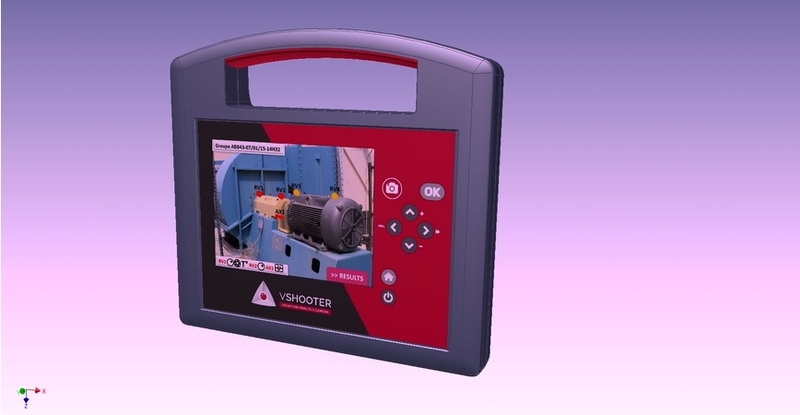 When measuring vibration signals, velocity also represents the rate of change in displacement and is expressed in inches (in) or millimeters (mm) per second. Mechanical motion around an equilibrium reference point.